Here's what individuals and communities can do to protect themselves. 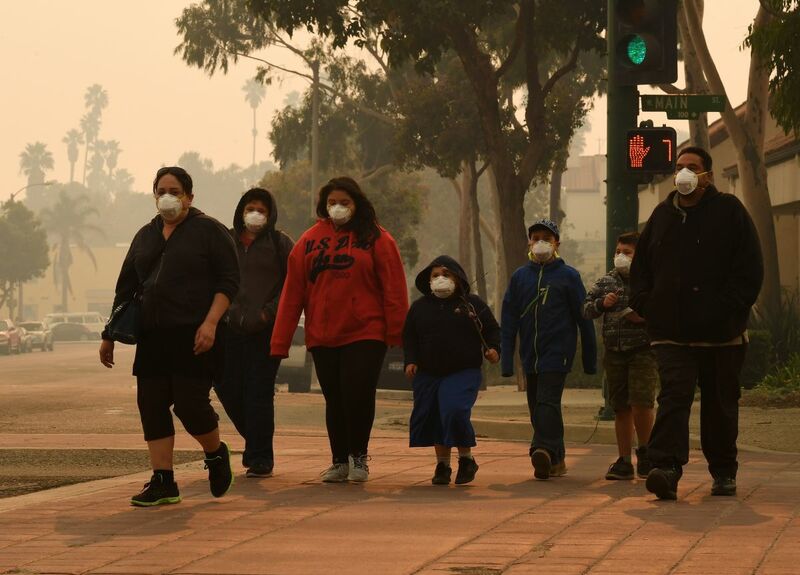 A family wears face masks as they walk through the smoke-filled streets of Ventura, California, on December 6th, 2017. Over the past few days, the mountains of Santa Barbara have slowly disappeared in a cloud of smoke. 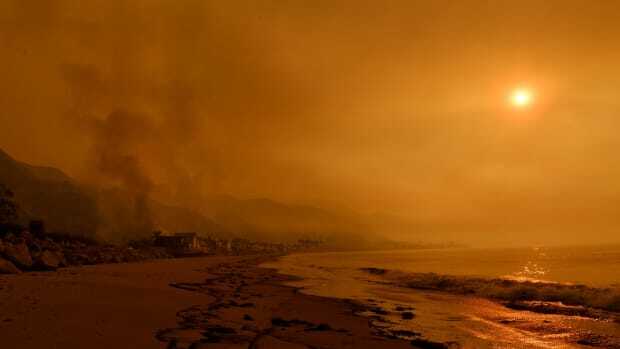 As the Thomas Fire continues to burn along the coast, Santa Barbara&apos;s green slopes have faded away behind a wall of yellow haze. The people of the American West are expected to endure more large, destructive wildfires in the future, the result of both climate change and more development in wild areas. As a result, more communities will likely have to deal with extended periods of intense wildfire smoke. Public-health agencies are just starting to figure out how to deal with that risk on a community level. 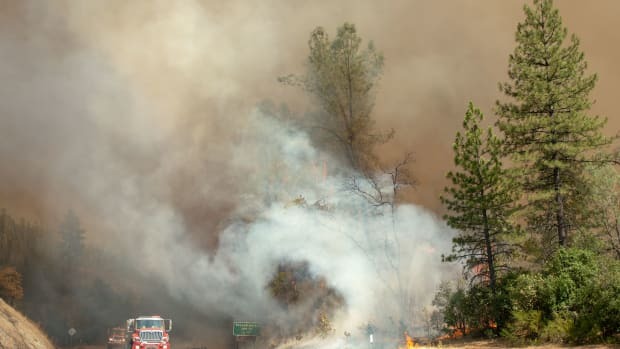 Pacific Standard spoke with public-health researchers who have studied wildfire smoke, some of whom saw their own communities shrouded during brush fires this summer. Here&apos;s what we learned. There are good reasons to avoid too much smoke during fiery days. Studies have found that, during past forest fires, surrounding communities saw upticks in visits to the hospital for asthma, heart symptoms, and respiratory illnesses such as pneumonia and bronchitis. Young children and the elderly were often most affected. Studies have noted slight increases in deaths during periods of intense smoke; researchers attribute those deaths to elderly people with pre-existing heart or lung conditions. Interestingly, pneumonia and bronchitis are caused by viruses and bacteria, not pollution. Researchers believe pollution negatively affects immune cells in the lungs, making the lungs less effective at sweeping away infections. But that effect probably only lasts a few days, says Michael Brauer, a professor of population health at the University of British Columbia. Overall, there aren&apos;t very many studies of the health effects of wildfire smoke because, historically, intense periods of smoke pollution were not common. It is also difficult to test the long-term effects of a short period of smoke exposure. Fortunately, researchers believe short periods of smoke exposure probably don&apos;t have long-lasting effects on healthy people. "There are parallels to maintaining a good diet; one chocolate chip cookie isn’t going cause significant weight gain, but a cookie every day likely will lead to weight gain," writes Richard Peltier, an environmental health researcher with the University of Massachusetts–Amherst. A List of Useful Wildfire Terms: If you&apos;re following coverage of wildfires, or trying to stay safe, here are some helpful definitions to know. In someone with a pre-existing heart or lung condition, however, smoke might cause a serious enough problem that it alters the course of their disease, Brauer says. 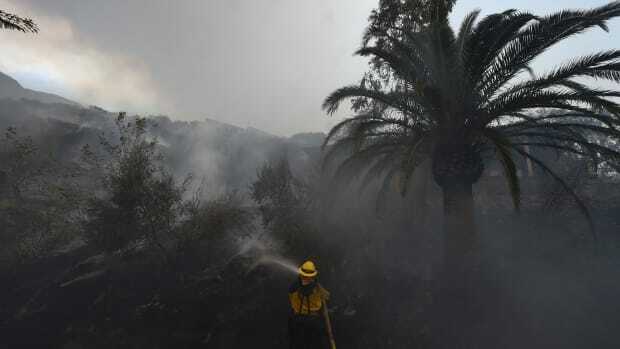 There are few studies of pregnant women exposed to wildfire smoke. One study of women who were pregnant during very large fires in Southern California in October of 2003 found that their babies tended to weigh up to a third of an ounce less than babies who had gestated entirely before or after the fires. The lower weights could have been caused by air pollution, the psychological stress of fires, or both, the study&apos;s authors write in their paper, published in the journal Environmental Health Perspectives. A difference of a third of an ounce is unlikely to affect a baby&apos;s health, the scientists add, but there&apos;s some debate about whether lower birth weights might reveal subtle patterns in a whole cohort of babies. It&apos;s a good idea to stay indoors, especially in spaces that filter their air, and not to exercise outside, experts say. Pacific Standard collected some practical tips here, including ideas for home, public spaces, and driving. In the longer term, many communities will need to develop strategies that will serve them in case fires and smoke become annual or near-annual events. "That was what we were saying here all summer, that this is the new normal," Brauer says. This past summer, Vancouver, British Columbia, where he is based, endured thick, smoky air from nearby wildfires for about a week. "You kept hearing the word &apos;apocalypse,&apos;" Brauer says. Experts encourage communities to designate "clean air centers," where people can spend time in filtered air for free. There&apos;s precedent for this: Many cities already offer air-conditioned public cooling centers, recognizing that deaths increase across cities when it&apos;s hot. 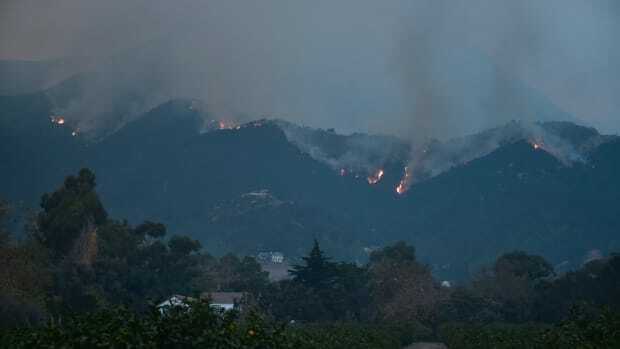 Doctors could also warn their patients when fire season is coming, making sure they have the needed medications for any lung and heart conditions. Home air filters are also a good idea. While communities evacuate because of fire risk, doing so for smoke is a tricky balance of priorities, Brauer says. People may become more exposed to smoke while evacuating than they would have had they simply stayed home. Plus, evacuation can be a distressing experience. People should also be mindful of their mental health. It can be scary to live under the pall of smoke, especially knowing that wildfires may become more commonplace in the future. During the smoky days in Vancouver, "people were really feeling quite down," Brauer says. "I think part of that is just losing control. There&apos;s not that much you can do. You can&apos;t run from this. You can&apos;t hide from it." But take heart: Indoor air filters really do work, most health problems seem temporary, and one day the smoke will clear and the mountains will re-appear. One idea for a long-term fix: Communities could designate clean air centers where residents can spend time in filtered air for free. 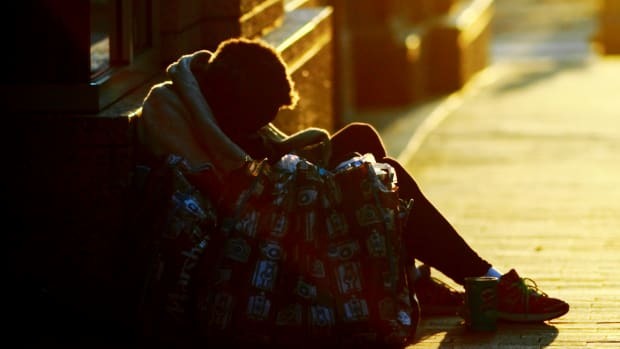 As Southern California's firestorm continues to grow and air quality plummets, what happens to one of the largest unsheltered homeless populations in the nation? 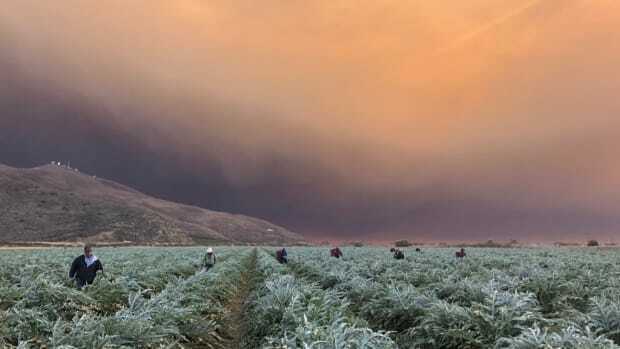 As fires clogged the air in Southern California, farmworkers continued to work, even as public-school students and others were told to stay home and indoors.